Cassoulet is a rich, slow-cooked bean stew or casserole originating in the south of France, containing meat (typically pork sausages, pork, goose, duck and sometimes mutton), pork skin (couennes) and white haricot beans. The dish is named after the cassole, the distinctive deep round earthenware pot with slanting sides in which cassoulet is traditionally cooked. Numerous regional variations exist, the best-known being the cassoulet from Castelnaudary, the self-proclaimed "Capital of Cassoulet", Toulouse, and Carcassonne. 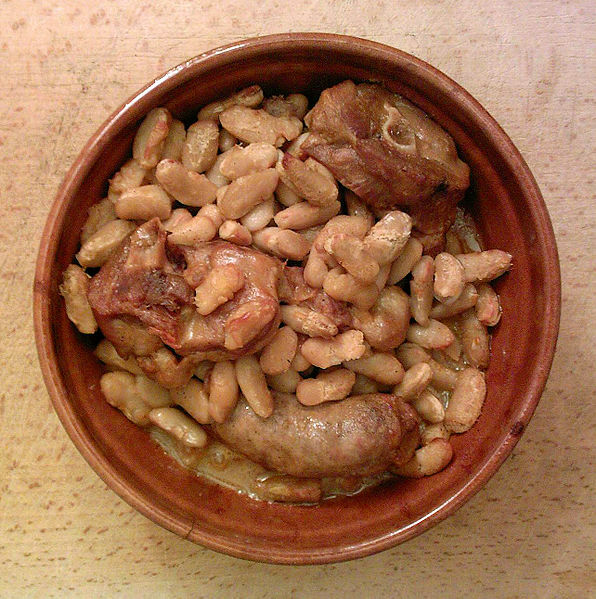 All are made with white beans (haricots blancs or lingots), which have replaced the medieval broad bean Vica fava, and duck or goose confit, meat and sausages. In the cassoulet of Toulouse, the meats are pork and mutton, the latter frequently a cold roast shoulder. The Carcassonne version is similar but doubles the portion of mutton and sometimes replaces the duck with partridge. The cassoulet of Castelnaudary uses a duck confit instead of mutton and serves it in a special dish (the "cassole"). Cassoulet is also sold in France as a commercial product in cans and can be found in supermarkets and grocery stores across the country. These cassoulets vary in price and quality. The cheapest ones contain only beans, tomato sauce, sausages, and bacon — duck and goose are expensive and thus are absent from such preparations. More expensive versions are likely to be cooked with goose fat and to include Toulouse sausages, lamb, goose, or duck confit. Haute cuisine versions require mixing pre-cooked roasted meats with beans that have been simmered separately with aromatic vegetables, but this runs counter to cassoulet's peasant origins. In the process of preparing the dish it is traditional to deglaze the pot from the previous cassoulet in order to give a base for the next one. This has led to stories of a single original cassoulet being extended for years or even decades. Many culinary traditions have similar techniques for slow cooking beans in a covered vessel. Examples include Feijoada, Fabada Asturiana, and baked beans. The Hungarian-Jewish solet and Eastern European cholent are similar bean dishes, and are also frequently cooked in combination with smoked poultry, especially goose leg, but a definitive relationship has not been established.